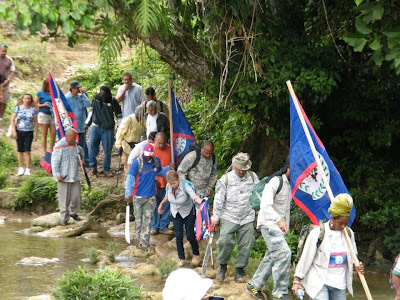 On the Belize-Guatemala borderline where over 125 Belizeans decided to clear Belize's defined borderline. The Guatemalan had the presence of the OAS while the Belize Defense Force soldiers observed from a distance as the Belizeans descended on Container Hill. Transportation from Jalacte Toledo to Santa Cruz Guatemala (borderline).